The Indianapolis—Union Station Wholesale Historic District’s brick, stone, and terra cotta commercial blocks and hotels demonstrate the impact of railroad trade on the growth of Indianapolis. Meridian was lined with simple houses prior to Indy’s railroad era. In 1849, railroads selected a site just south of downtown as the gathering point for all rail lines. Union Station has remained on this site, with a later building replacing the original 1850s train shed. The placement of Union Station destined this part of downtown to become commercial in use. By the 1860s, merchants had taken advantage of rail access to set up wholesale buying and selling operations in the district. Many buildings in the district feature cast-iron for storefronts or other architectural elements. Tall, narrow buildings had multiple upper stories to allow for vertical storage while using the least amount of valuable land. The city’s largest collection of 19th and early 20th century commercial buildings is located in the district, including some that reflect significant innovations in commercial architecture. 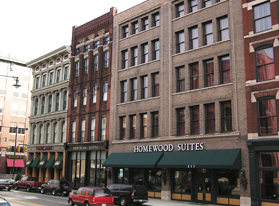 The Byram, Cornelius & Company block at 201 South Meridian has the city’s oldest remaining cast iron façade (1871-72). Next door at 207 South Meridian completed in 1888, architect John Stem cloaked an iron frame in Romanesque Revival brick and terra cotta work. Across the street at 202-204 South Meridian, the 1889 McKee Building features a rectilinear grid of cast iron, designed by local architects R. P. Daggett & Company. Glazed terra cotta became popular in the 1920s, and the Big Four Railroad Building at 105 South Meridian, by D. A. Bohlen & Son, is an excellent example. Hotel keepers also found ready business on the doorstep of Union Station in the district. The Hotel Severin (now Omni Severin) at 43 West Georgia was built in 1913 to plans of local firm Vonnegut & Mueller. It was intended for wealthy visitors. Others were aimed at the business traveler, like the Warren Hotel at 123 South Illinois, now the Canterbury Hotel. 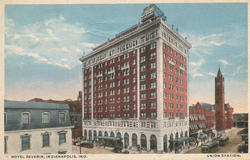 The Indianapolis—Wholesale Historic District is in the immediate south portion of downtown, in the 100 and 200 blocks of South Meridian and Pennsylvania Sts. and the 200 block of South Illinois, roughly bounded by Capitol Ave., Maryland, Delaware, and South Sts. Many restaurants and entertainment venues are located in the district, including live music. Braden’s Block, J. F. Darmody Company Building, Elliott’s Block, House of Crane Building, Levey Brothers & Company Building, Levy Brothers & Company Building Annex, Louis G. Deschler Company Building, Malott Building, William B. Mumford Printing Company Factory, Reinhardt Building, Rost Jewelry Company Building, Schnull & Company Building (demolished), Union Station, and 122 South Meridian Street have been documented by the National Park Service's Historic American Buildings Survey.